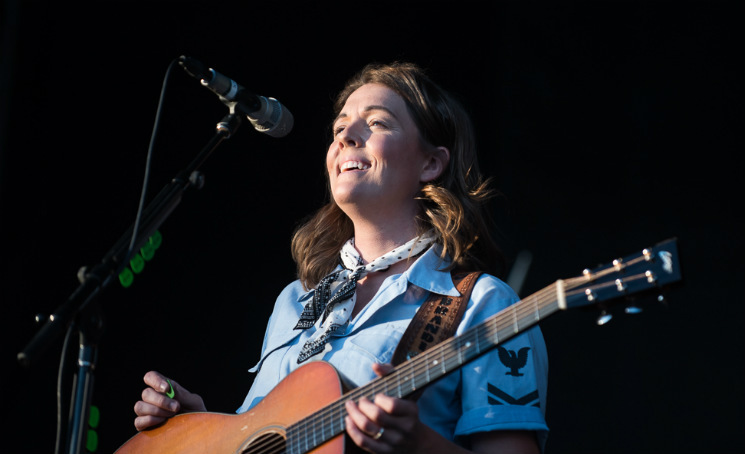 Brandi Carlile undoubtedly possesses a healthy amount of confidence in her craft — she was able to wrangle some of music's biggest superstars, including Adele, Dolly Parton, Kris Kristofferson and Pearl Jam, to contribute renditions of her songs for this year's Cover Stories benefit LP. And it was that unyielding credence that the Seattle alt-country star brought to the stage for her co-headlining slot during the first Saturday night (July 8) of Ottawa's sprawling ten-day Bluesfest. Sandwiched between performances by Ottawa hip-hop trio Flight Distance and a headlining gig by 50 Cent, Carlile nonetheless brought out a small but loud and proud crowd of festivalgoers. Hitting the stage with her backing band "The Twins," led by identical brothers Tim and Phil Hanseroth on guitar and bass respectively, Carlile absolutely beamed with joy as she launched into "The Things I Regret" from her latest LP, 2015's The Firewatcher's Daughter. Following up with "Raise Hell" from 2012's Bear Creek and "Again Today" from 2007's The Story, Carlile played off her band brilliantly, participating in a gorgeous three-part harmony for "The Eye" while inviting drummer Brian Griffith to the front of the stage to play the washboard (strapped across his chest) on the buoyant "Keep Your Heart Young." As the Hanseroth brothers took to the corners of the stage to hammer out polyrhythmic beats for a raucous version of "Pride and Joy" from 2009's Give Up the Ghost, Carlile and her four-piece band promptly left the stage before returning for a rare Bluesfest double-encore. Closing the 70-minute performance with a four-octave-pushing rendition of Led Zeppelin's "Going to California" and perhaps the most joyous rendition of the Cyndi Lauper classic "Girls Just Want to Have Fun" I've heard, Carlile showed the adoring crowd that it only takes an infectiously positive stage demeanour and a fistful of confidence to deliver a memorable performance.